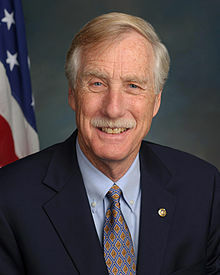 Angus King is an Independent US Senator from Maine. One of King’s first jobs, after graduating from Dartmouth College in 1966 and the University of Virginia Law School in 1969, was as chief counsel to the U.S. Senate Subcommittee on Alcoholism and Narcotics in the office of Maine Democratic Senator William D. Hathaway. King began his career as a staff attorney for Pine Tree Legal Assistance in Skowhegan, Maine. After his service in Washington, D.C., he returned to Maine to practice law and began his 18-year career as host and co-producer of the weekly television program “Maine Watch” on the Maine Public Broadcasting Network. In 1983, King became vice-president of an alternative energy development company based in Portland and Boston. Six years later he founded Northeast Energy Management, Inc., a developer of large-scale energy conservation projects at commercial and industrial facilities in Maine. He was first elected governor in 1994, becoming Maine’s second independent governor. Four years later, he was reelected by one of the largest margins of victory in the state’s history. After he left office, King practiced law and became a Distinguished Lecturer at Bowdoin College where he taught a class called “Leaders and Leadership.” He also started Independence Wind to develop wind projects in Maine. Angus King is a candidate who advocates sensible national security positions. He supports further nuclear reductions negotiated with Russia and would vote to ratify the Comprehensive Nuclear Test Ban Treaty. He has endorsed the Kissinger-Schulz-Nunn-Perry vision of moving toward a world free of nuclear weapons. He supports the Obama plan to withdraw a significant number of U.S. forces from Afghanistan, with the remainder out by 2014. He advocates continuing dialogue with Iran. John Isaacs, executive director of the Council and Center, was next up at the podium and introduced fellow Dartmouth alum, Senator Angus King (I-ME). Senator King recalled his early days in DC as a campaign staffer and how even then, Council supporters were making an impact with every $5 and $10 contribution they made to his former boss. .
Angus King (I-ME) for Senate was endorsed in 2018 by Council for a Livable World. Former Governor Angus King was first elected to the Senate in 2012 when a three-term incumbent retired. He ran and won as an independent, one of only two in the Senate, supported by Democratic political organizations, and has chosen to caucus with the Democrats. He is likely to face two opponents again in 2018, a little-known Democrat and possibly controversial Governor Paul LePage, who campaigned and governed like Donald Trump before the President took office. Senator King is favored, but three-way races, common in Maine, have proved unpredictable. King serves on the Senate Armed Services Committee. On the committee, he has spent much time focusing on the nuclear weapons issues as well as cyber-security. In 2013–2014, King received a perfect 100%. in 2015–2016, the Senator voted for the Iran nuclear deal and against “poison pill” amendments designed to kill the agreement. A march and rally marking the 50th anniversary of Rev. Martin Luther King Jr.'s March on Washington on Capitol Hill, beginning a day of events recalling the historic 1963 civil-rights demonstration. The march along a 1.6-mile route downtown will pass several buildings with significance for the civil-rights era, including the Justice Department, U.S. Courthouse, Department of Labor and Washington Monument. The procession, to be led by a restored 1960s-era bus like that used by civil-rights activists the Freedom Riders, is expected to draw upward of 100,000 participants. The original march, which demanded jobs and equal rights for blacks, drew about 250,000. The route ends about midday at the Lincoln Memorial, where President Barack Obama will speak while standing in the same spot on the memorial steps where Rev. King gave his "I Have a Dream" speech, a stirring vision of equality, exactly five decades ago. Mr. Obama will cap two hours of official speeches between 1 and 3 p.m.
Wednesday's speakers include former presidents Bill Clinton and Jimmy Carter, as well as civil-rights protest hero Rep. John Lewis of Georgia, the only surviving speaker from the original 1963 event. D.C. In January 2014 fresh off their visit to Egypt, Lebanon, Israel and Palestine, Senators Tim Kaine (D-VA) and Angus King (I-ME) brought their experiences back to Capitol Hill. The hearing included testimonies from Lawrence Silverman, Acting Deputy Assistant Secretary of State for Near Eastern Affairs; Major General Michael T. Plehn, Principal Director for Middle East Policy in the Office of the Secretary of Defense; Dr. Paul Salem, Vice President of the Middle East Institute; and Mr. Aram Nerguizian, Senior Fellow and Burke Chair in Strategy at the Center for Strategic and International Studies. The visit to Lebanon was a first for both senators, who called the country an “overlooked neighbor” when it came to the impact from the Syrian crisis, a point also made by AAI President, Dr. James Zogby, last October. In Lebanon, the senators met with government officials and discussed the recent formation of a new government, upcoming presidential elections and U.S. humanitarian assistance to deal with the influx of refugees from Syria, which now make up a quarter of Lebanon’s population. The delegation also focused on growing security concerns related to Hezbollah and other extremist groups and discussed the security relationship with the Lebanese Armed Forces. In addition to traveling to Lebanon, the visit to the region included meetings in Palestine with Palestinian President Mahmoud Abbas, Prime Minister Rami Hamdallah and Palestinian Authority chief negotiator Saeb Erekat. The senators also met with Prime Minister Benjamin Netanyahu, Israeli Defense Minister Moshe Ya’alon, members of the Knesset and Israeli Justice Minister Tzipi Livni to discuss regional security and the Israeli-Palestinian peace negotiations. In Egypt, ongoing crackdowns on journalists, academics and supporters of the Muslim Brotherhood continue, and the recent resignation of the government has prompted speculation that Defense Minister Abdel Fattah al-Sisi will run for president. Kaine met with interim President Adly Mansour, Minister of Foreign Affairs Nabil Fahmy and al-Sisi to discuss Egypt’s democratic transition, economic policies and concerns over the jailing of journalists. With the regional director for Senator Angus King (I)-Maine, Ben Tucker,advocating support for Senator Bernie Sanders letter to Secretary Mike Pompeo to address the humanitarian crisis in Gaza. The letter urged as a first step restoration of funding for the United Nations Relief Agency and Works Agency for Palestinian Refugees (UNRWA). The meeting lasted an hour. In addition three messages from Israelis were also delivered. ↑ [Williamson, Elizabeth. Wall Street Journal (Online) [New York, N.Y] 27 Aug 2013: n/a. This page was last modified on 31 January 2019, at 04:08.